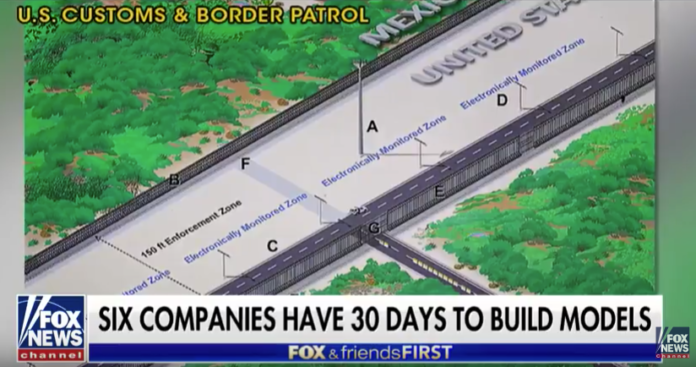 The federal government gave the media a first peek Wednesday at construction of prototypes for President Donald Trump’s proposed border wall. Crews working on two of the eight prototypes moved dirt, with one of the crews also installing steel reinforcing bars before concrete is poured. Each crew gets only 60 square feet (18.2 square meters) to work on their prototype, prompting some to do assembly work elsewhere before moving the structure to their designated position. Contractors have 30 days to finish. The rectangular construction zone is fenced off from public viewing in a remote area of San Diego along the Mexico border. The models will be tested for the ability to withstand sustained drilling with power tools and to deter crossers with anti-climbing features. They also must be aesthetically pleasing from the north side. The government will consider the models to guide the proposed construction on the nearly 2,000-mile (3,200 kilometer) border with Mexico. Trump says he wants them to be see-through. Funding is a big question. The administration has requested an initial $1.6 billion next year to replace 14 miles of fencing in San Diego and build 60 miles in the Rio Grande Valley in Texas, the busiest corridor for illegal crossings. Democrats have balked at providing the money. Previous articleRinaldi: What would you do in the last hour of your life?